Zimbabwe's system of National Parks and Reserves is extensive, well-organized, and notable for the range of safari experiences that are available. Its parks cover a wide variety of environments and contain an enormously diverse collection of species. Moreover, Zimbabwe offers travellers many different means of safari travel and game viewing: open vehicles are permitted, as are night game drives; walking safaris and boat safaris are available, the latter including motor launch, canoe, kayak, and even houseboat. The Zambezi also offers some of the finest whitewater rafting in the world. Victoria Falls, like Mount Kilimanjaro, is an emblem of the entire African continent. Spanning 5600 feet (1700 m) and dropping 420 feet (128 m) into the Zambezi Gorge, the falls create a roar--and a cloud of mist--so great that they are perceptible from a distance of 25 miles (40 km). David Livingstone was the first European to visit the falls, in 1855, and he named them in honor of his queen. The best time to visit Victoria Falls is between September and November. During March and April, when the water volume is at its peak, the falls create so much mist that they are difficult to see, and from May to September the mist adds to the season's high humidity. There are all sorts of activities offered at Victoria Falls, including bungee jumping, small plane flights over the falls, and raft trips to the Boiling Pot at their base. In addition to such thrill ride activities, Victoria Falls is also the center for some of the best safari and adventure opportunities in Africa. Above the falls, outstanding canoe and kayaking safaris are available, offering one of the most exciting and memorable ways to experience both the Zambezi and the abundant game of Zambezi National Park. Below the falls, the Zambezi becomes a whitewater rafting paradise. The rafting trips that run through the river's gorges are internationally known as the most exciting, and least dangerous, to be found anywhere. Further east, and further downstream from Victoria Falls, is located this enormous (almost 2000 sq. mi./5200 sq. km) man-made lake. Formed in 1958 by the damming of the Zambezi at Kariba, the lake is now an attraction in its own right. Its scattered islands, clear, deep waters, and adjoining game reserve complement each other admirably. 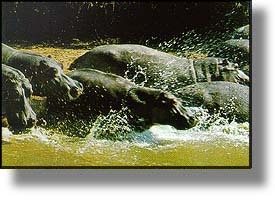 The reserve, Matusadona National Park, was begun as a refuge for animals saved from the rising waters of the lake itself. Today, its abundant game gathers along the lake shore, particularly in the dry months, where it is easily viewed from the water. Zimbabwe's fine small houseboat lodges are located here, and the Lake also serves as the starting point for canoe safaris to Mana Pools National Park. The next major attraction along the shores of the Zambezi is Mana Pools, a region in which the Zambezi slows and spreads out into a multitude of small ponds and pools. During the dry season, the Mana Pools attract a scarcely believable abundance of wildlife, including lion, leopard, zebra, and hippo in addition to an unusually wide variety of antelope species. Canoe safaris to and through the Mana Pools during this time of year can be absolutely stupendous experiences. Another attraction of this park is that walking safaris are the only other means of touring allowed in certain sections, ensuring not only quiet but also many fewer signs of other visitors. Most of the border with Mozambique is consumed by this massive park, which contains over 2,000 square miles of open wilderness. Gonarezhou is Zimbabwe's second largest park, and it was only recently opened to international tourists. 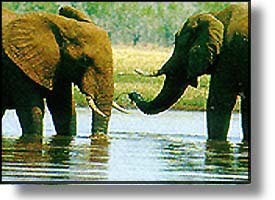 Gonarezhou means refuge for elephants, and they are among the main attraction at the park. It was here that one of the largest elephants ever recorded was shot and killed by the famous poacher Cecil Bernard in the 1920's. His name was Dhlulamithi, taller than the trees, and one of his tusks weighed 110 kilograms. Unsurprisingly, elephants here have been hunted so much that they are not particularly fond of human beings, and they should be viewed with extreme caution. Other game, however, such as king cheetah and nyala and suni antelope are less wary equally abundant, especially near the Runde River. Hwange, which is located south of Victoria Falls and along the Botswana border, covers more than 5600 square miles (14,500 sq. km.) of highveld and semidesert. It enjoys one of the highest concentrations of wildlife in the country, and is the particularly renowned for its great numbers of elephant. Like Kruger National Park in South Africa, Hwange is connected to several private reserves that offer less restricted and far more pleasurable game viewing--including both walks and night drives. The landscape of this small southern park is somewhat unnerving. All throughout the park, on hundreds of small hills, are precariously balanced freeform stacks of granite boulders. Cecil Rhodes was buried on one such hill, located just a few kilometres from the park entrance and offering a panoramic view out over the plain. With so many fine perches, it is unsurprising that Matobo has the greatest concentration of black eagles in the world. Other bird species abound as well, as do many different species of game animals. Matobo also attracts visitors to its thousands of rock paintings, many of which are amazingly well-preserved.